Travis Tacey is in a peck of trouble. His mother is hospitalized from a serious accident and his father, lost in a haze of grief, has focused his anger and guilt on his oldest son. Which is why, at age fourteen, Travis finds himself out of a home and on the road in New York State’s Adirondack Mountains. With no more than a few dollars, a change of clothes, and his great-great-great grandfather’s guitar, Travis wonders how he is going to survive. But the world is not always cruel, as Travis discovers when he is befriended by guitar-maker Scott McKissack and realizes that with luck, and music, he might even be able to reunite his shattered family. 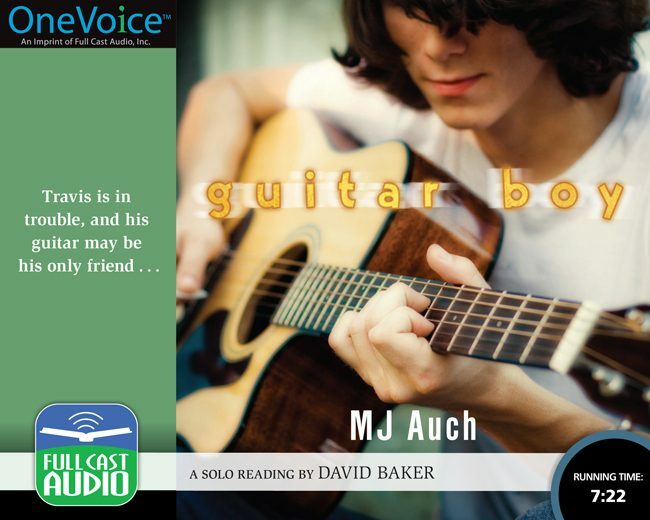 Richly populated with vivid and endearing characters, resonating with a love of music, this recording of MJ Auch’s novel will speak (and sing) directly to the hearts of listeners of all ages.